Memory: We all know what’s it’s like to memorize things either for an exam, for a meeting or simply your shopping list – not that easy for most of us. Why is memory so important but sometimes tricky to handle? Learning how to memorize is surprisingly not something we are thought even though there are numerous scientific publications available about our memory. Somehow we miss out to learn which memory techniques exist and how they work. Of course, everybody has a different learning style, which we will look into at a later time, but some let’s look at some useful techniques for memory you can implement immediately for your learning. Joshua Foer refers in his Ted Talk “Feats of memory anyone can do”. Let’s have a closer look what winners of the US Memory Championship like Joshua do differently in mastering the memory place, a technique that helps them succeed. All those champions claim to have average memories to start off but they train themselves to using a set of ancient techniques from Cicero or medieval scholars who used those to memorize speeches or books. Back in the days it was a common practice to train your brain through day-to-day activities whereas today we are outsourcing our memory through technology making and thereby the need to remember disappear. Ask yourself….how many phone numbers do you remember by hard? Exactly! So, let’s look at how your memory can be trained. Two people are told the same word Baker but in different contexts. One person is told “ Remember there is a guy called Baker” and the second person is told “Remember there is a Baker”. Guess who will remember the memorized word “Baker” later on, if asked? Exactly, the second person who is give a context, namely that his job is a Baker is more likely to remember the word than the person who is purely told his name is Baker. Why that? The name Baker doesn’t mean anything whereas the word Baker has an association for us, it’s the person who smells well, makes our bread, delicious dessert. This technique is tacking information that is lacking in context, significance or meaning and transforms it into context that’s meaningful to our mind. This technique goes back to a poet who was about to deliver his poem for entertainment during ancient Greek times at a banquette. The moment he walks out to start his poem, the palace collapses and kills everybody inside and everybody is killed. Later on, the poet tries to remember the people inside to take their relatives to the places their beloved ones were sitting at the time of the collapse. By closing his eyes he can see with his minds eye where each person was sitting purely using his visual memory. Even though we are bad at remembering names, phone numbers or shopping lists, we have a great visual and spacious memory. The idea is to create pictures behind your minds eye and fill it with images you can remember. The crazier, weirder, the more bizarre the imagines will be, the more unforgettable and the more memorable the image will be. Joshua gives a great example of how he “memorized” his Ted Talk through visual reminders structuring those topic by topic. To use visual aids in your studies, check out the concept of mind-maps, which is based on both principles above – creating context and visualisation. The Mind Map Book: How to Use Radiant Thinking to Maximize Your Brain’s Untapped Potential by Tony Buzan will tell you all about the science and application of the mind-maps. 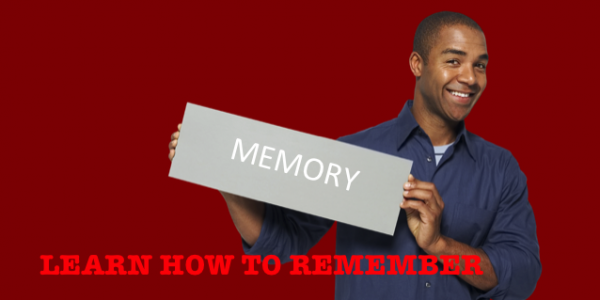 What do you do to improve you memory?